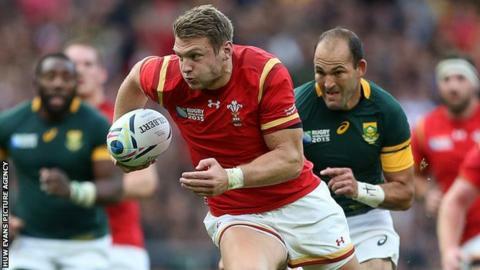 Wales fly-half Dan Biggar is close to signing a new dual contract to remain with Ospreys, according to the region's head coach Steve Tandy. The 26-year-old is out of contract at the end of the season and is in demand after excelling during the World Cup. But Tandy expects Biggar to sign a new deal soon and is hopeful that lock Alun Wyn Jones will also recommit to them. "We're really hopeful on both of them. I think probably Biggs [Biggar] is pretty close," Tandy said. "Alun Wyn is probably still... a little bit away from that yet. "But it's constant conversation and we're hopeful to keep those two outstanding Ospreys at this club. "They're a massive part of what we've achieved so far and they're the heart-beat of what we do going forward, so it would be pretty positive if we could get those two wrapped up." Biggar, who has won 39 caps and scored 209 points for Wales, and 30-year-old Jones - who has 94 Wales caps and six for the British and Irish Lions - are two of Ospreys' crown jewels. Both signed three-year deals in March 2013 when dual contracts were first introduced in Wales, which are funded 60% by the Welsh Rugby Union and 40% by the regions. Tandy believes that has made it easier for the Welsh regions to hold onto their stars and is closer to the model operated by Ireland and Scotland. "Since I've taken over, about four years ago, for three years you were probably in survival mode - the Welsh Rugby Union and the regions going head to head," Tandy added. "But the time is changing where hopefully there's a joined-up approach and working together, which you can see starting to happen even though with the senior team we've always had a good relationship with the coaches and understanding of our players."